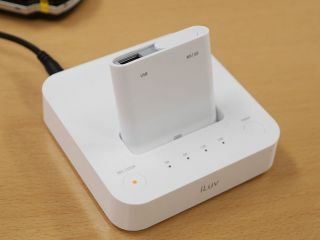 IMJ Japan's iLuv-i182WHT is a multi-purpose video recorder. In an industry where daft names and meaningless monikers are commonplace there are few as vapid as IMJ Japan 's iLuv-i182WHT video recorder for mobile devices. That seemingly random collection of characters, however, is fortunate in that it's attached to a very capable little product. The ¥22,800 (£97) recorder combines a base unit that features a dock for the ubiquitous iPod (5G) and S-Video and composite ports with an adapter that fits the dock to accommodate various memory cards and USB devices, including the PlayStation Portable. The idea is really pretty simple - just connect a video source, such as a TV, DV video camera or set-top box, to the base unit, plug in either an iPod or the adapter and a PSP, PMP, USB drive or whatever and hit the record button. There's also an off timer button to tell the iLuv (we'll settle on that) when to stop shuttling digital video across the gulf. Admittedly, the encoding format and video size need to be set by connecting the kit to a PC (or Mac, amazingly) and firing up the supplied software, but it's still a smart way of getting video onto a portable device. For the record, the permutations are vast - various tweaks on the MPEG-4 theme and H.263 encoding, three resolution settings for each, three possible bitrates to determine file size/quality, and SD card, Memory Stick, USB, PSP and iPod as possible destinations. Still doesn't make those home videos any more tolerable though.